Terra General Contractors has gone bold. 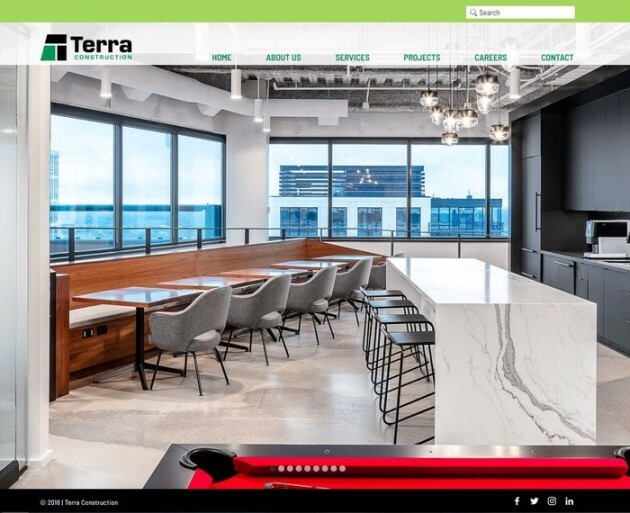 The Rogers-based construction company has rebranded itself as Terra Construction. This week it launched its new website and showed off its new name and redesigned logo. “We are trying to at least make sure people know who we are because every time we turn around it seems like [people say] ‘Well, I’ve never heard about you.’ and ‘Tell me about your firm,’” said Tom Brown, majority owner of Terra, in an interview. The 30-person firm works on a multitude of projects including in education (primarily higher education), office and industrial tenant interiors, public municipalities such as fire and police stations, and health care. Terra subcontracts most of its work. In 2015, the firm was named contractor of the year by the Minnesota Subcontractors Association. Terra is currently working on several projects including the construction of a retail facility for a new Dunkin’ donut shop and Red’s Savoy Pizza parlor at the location of the old Dairy Queen on Snelling Avenue in St. Paul, a $3 million Brooklyn Park Clinic expansion for Hennepin Healthcare and a GEOS (Global Edible Oils Solutions) lab in Savage for Cargill. As part of the rebranding, the logo has been changed so the “t” in Terra was capitalized to make a statement about the strength of the company. “Now I think it’s time to be a little bit more bold and a little bit more proud of what we have done,” Brown said.